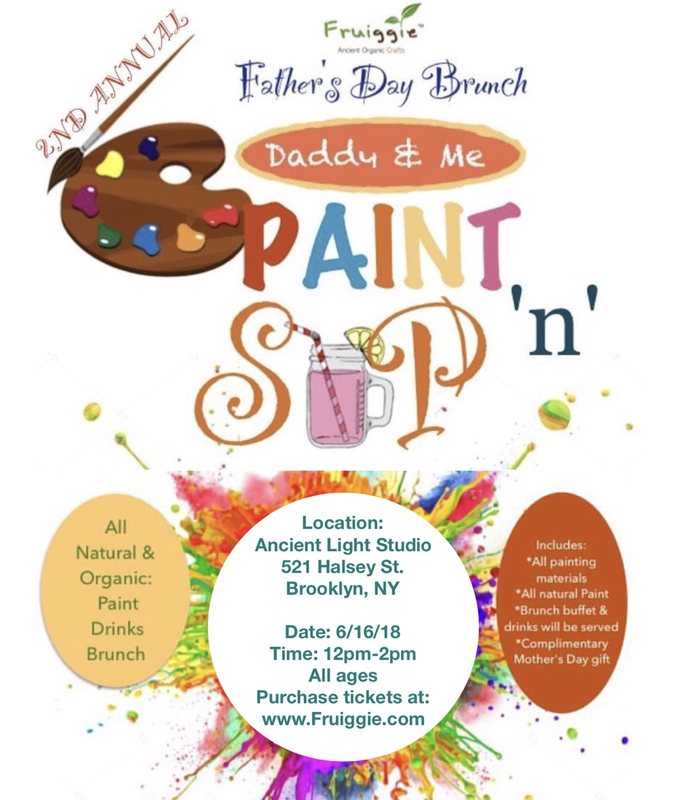 We are so excited about our 2nd annual Fathers Day "Paint 'n' Sip"! Our Mother's Day "Mommy and me Paint 'n' Sip was a success and we would love to show the same appreciation for the Dads as well!! Fathers your role in your child's life is extremely important. You're the providers and protectors of the family! Therefore you are equally as important as Mothers. We want to show our appreciation for your wonderful hard work and dedication! 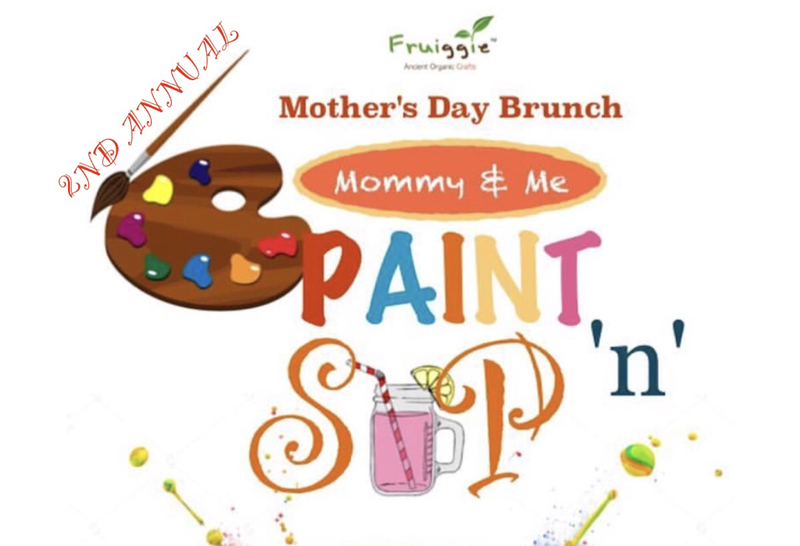 You and your little one (or not so little one) will enjoy a fun filled day sitting side by side painting with all natural Fruiggie paint, sipping on organic fruit infused drinks and indulging in an organic brunch buffet! No experience needed to paint! Create your masterpieces and learn together! Looking forward to painting and sippin with you all! We are back again for our 2nd Annual Mothers Day "Paint 'n' Sip" brunch! Mothers have such a rewarding job yet challenging as well. We want to show our appreciation for your wonderful hard work and dedication! and indulging in an organic brunch buffet! No experience needed! Create your masterpieces and learn together! We are so excited about our Mothers Day "Paint 'n' Sip"! Kids Style Paint 'n' Sip!! while sipping on organic drinks in mason jars (that they can also take home) and indulging in organic snacks! including eco friendly paint brushes, twigs, leaves, and bottle caps. Lets paint and have fun with our wellness in mind! 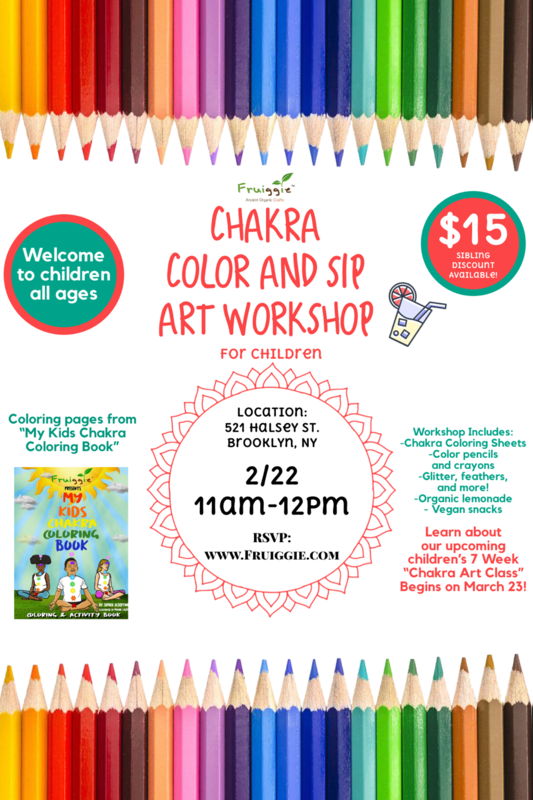 Join us for our FREE Kids Chakra Art Workshop tomorrow at Stellar Yoga Space and Lark Café in Brooklyn! 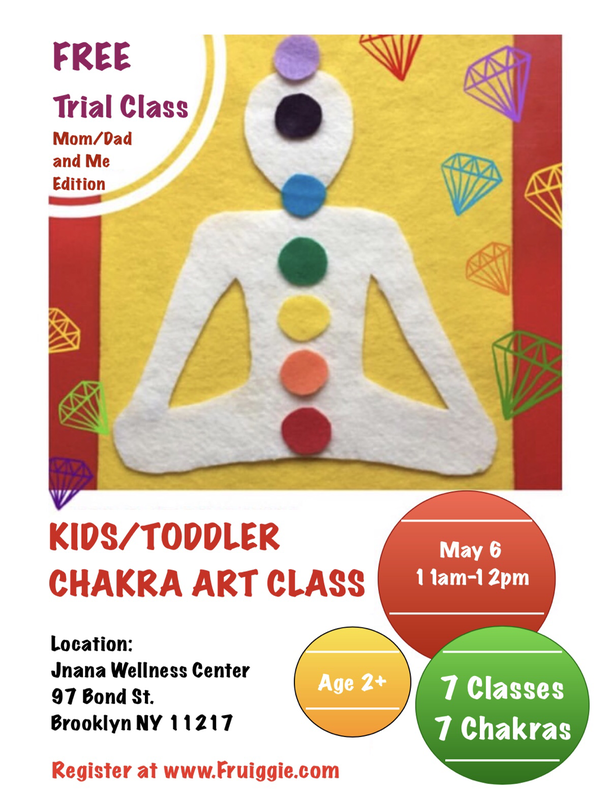 This is an intro to our 7 week Chakra Kids Art Classes that will begin 11/6-12/18. the meaning of the colors, and how to balance their emotions through fun art activities. as well as the colors that we choose to wear for the day. FREE vegan snacks will be available! With Food in Mind, a nomadic art and culture nonprofit devoted to the fight against child obesity, has teamed up with the for-profit Fruiggie, an eco-friendly arts and crafts studio offering classes for children that feature paints made with fruits and vegetables. Together, we've developed a trifecta of fun for kids aged 4 and up. First, they will prepare With Food in Mind's "Fruity Pop" recipe (a healthier alternative to sugary sodas and fruit juices), then transform the leftover fruit scraps into paint, and finish up by making a painted work of art. The workshop will be co-taught by Fruiggie founder Tamika Albertini and With Food in Mind founder Nicole J. Caruth. This drop-off class is $20 in advance or $25 for drop-ins. Half of all proceeds will go to With Food in Mind's Fruity Pop Workshops for children in underserved communities. Class will take place at Lark Cafe—a light-filled eatery with a playroom—in the Ditmas Park neighborhood of Brooklyn, New York. Parents, this is a drop-off class. Run errands while the kids create or sit back and enjoy Lark's delicious beverages and locally made goodies. Join us for a fun day of natural play-dough making!!! In this class, students will make their own play-dough and will use natural homemade food coloring and scented oils/herbs to create beautifully vibrant colored and scented dough. Play-dough cutters will also be available to create cool shapes, then packaged to take home! *All Fruiggie play-dough are non-toxic, VEGAN and GLUTEN FREE. *All Fruiggie food coloring are made from natural organic fruits, vegetables and plants. 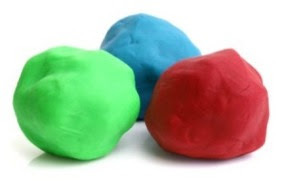 *Experimenting with Fruiggie play-dough, will help to strengthen kids fine motor skills and sensory development.